During the Middle Ages, thousands of monastic communities were founded throughout Europe. Throughout this period, different types of monasteries were formed, which had different emphasizes and goals. One theme that emerges over time was that men and women interested in becoming monks and nuns were often seeking movements that sought to reform monasticism with stricter rules and more attention paid to living a simple life. Early Christian monasticism – this practice started emerging in Egypt and Syria around the third century, where men began to seek out solitary existences devoted to prayer and meditation. St Anthony of Egypt (d.356) is considered to be the father of monasticism, having spent 80 years living as a hermit. Soon these individuals started to congregate into small communities for prayer and instruction. The idea of monastic settlements would find acceptance into the Christian world and slowly spread to Byzantium and Western Europe. Saint Basil the Great (c. 330 – 379) created monastic rules that were generally followed within the Byzantine Empire. Celtic monasticism – as Christianity spread into Ireland and parts of Great Britain during the late 4th and 5th centuries, monastic communities emerged in places such as Iona, Lindisfarne and Kildare. Several early Irish monks were noted for being missionaries, traveling into Great Britain and continental Europe to convert non-Chrisitians. Benedictines – members of an order founded by St. Benedict in the sixth century, they were perhaps the most common type of monastic community during the Middle Ages. 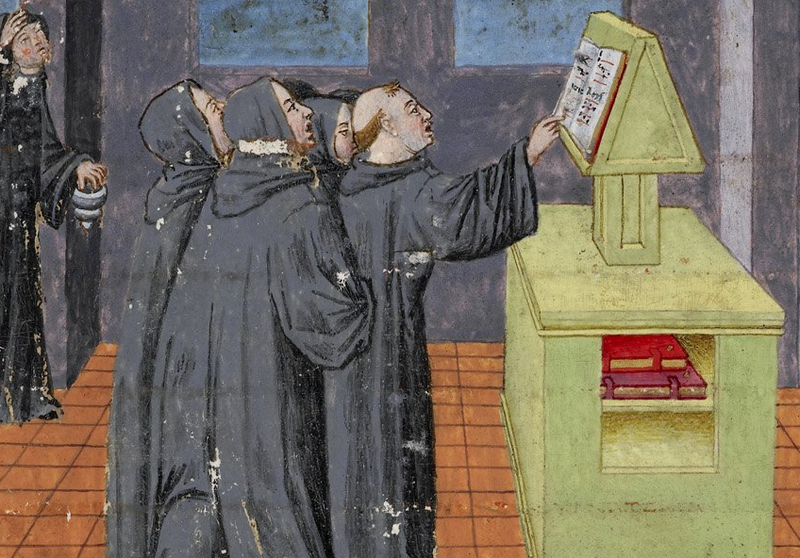 Known as the Black Monks because of their style of clothing, and were noted for their commitment to writing. Several medieval Popes were originally Benedictine monks. Cluniacs – a reformed component within the Benedictines, this order was centred around the monastery of Cluny in France. Founded in 910, they believed that monastic rules had grown lax and too involved in secular affairs. These monks would follow stricter practices and spend more time in prayer. This movement spread out to other parts of Europe, so by the 12th century one could find about 300 houses, all of which were subordinate to the abbot of Cluny. Cistercians – starting with a French abbey founded at Citeaux in 1098, they valued manual labour, self-sufficiency and a return to a more literal adoption of the Benedictine rules. Called the White Monks for wearing white cloaks, their most famous member was Bernard of Clairvaux (d.1153), a well known preacher who was frequently involved in ecclesiastical and political issues. By the 15th century, one could find over 750 Cistercian houses across Europe. Carthusians – an order founded in Germany in 1084, they were noted for their austerity, where members lived in their own cells and spent several hours a day in prayer and meditation. By the end of the Middle Ages, one could find about 200 houses spread across Europe. Premonstratensians – Founded in France in 1120 by St Norbet of Xanten, this order combined a contemplative life with an active role of teaching and preaching. Also called the White Canons, this order was involved with converting pagan peoples in Eastern Europe. Trinitarians – an order based in Iberia, their main function was to help ransom Christian captives from Muslim lands. Beguines – a lay order for women that began around the 12th century, they were most popular in the Netherlands and Germany. Focused on charity and prayer, some of the women involved were known for their mysticism and for getting in trouble with ecclesiastical authorities for their views. Beghards – a male lay order that emerged from the Beguines, it was centred around the Low Countries and France. Like the Beguines, men involved here did not take formal monastic vows but were committed to prayer and social work. Mendicant Orders – orders where members would beg for their livelihoods. Dominicans – a mendicant order like the Franciscans, they were also focused on maintaining their poverty. Sometimes known as the Black Friars, they were founded by St Dominic in 1216, and were interested in education and preaching. Hospitallers – a military order also called the Knights of St. John, they were founded in the 11th century to assist the sick and pilgrims. As the crusades swept into the Middle East during the 11th and 12th centuries, the order became more centred on military activities. By the end of the Middle Ages the order was based in Malta, with its main goal being to fight against the Ottomans. Templars – a military order created in 1119, they were active in the Holy Land during the crusades. After the fall of the crusader states, the order was targeted by the French king Philip IV because of their wealth and for accusations of heresy. The Papacy formally suppressed the Templars in 1312, and some of their leaders were executed. Teutonic Knights – another military order that was formed in 1190 predominantly with German support. Initially created to fight in the Holy Land, their focus soon switched to northeastern Europe, where from the 13th to 15th centuries they carved out a state for themselves. There were many other smaller monastic organizations as well – Carmelites, Augustinians, and Poor Clares are some examples. Click here to learn more about medieval monasticism.